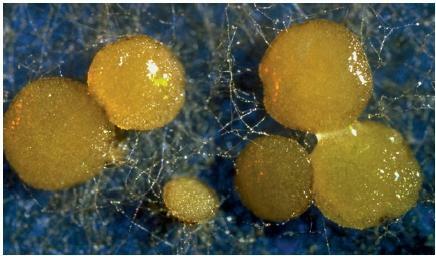 Yeast are microscopic, single-celled organisms that are classified in the family Fungi. Individual yeast cells multiply rapidly by the process of budding, in which a new cell begins as a small bulge along the cell wall of a parent cell. In the presence of an abundant food source, huge populations of yeast cells gather. The cells often appear as long chains with newly formed cells still attached to their parent cells, due to the short budding time of two hours. Yeast are among the few living organisms that do not need oxygen in order to produce energy. This oxygen-independent state is called anaerobic (pronounced a-na-ROE-bik; "without oxygen"). During such anaerobic conditions, yeast convert carbohydrates—starches and sugars—to alcohol and carbon dioxide gas. This process is known as fermentation. The fermentation process of yeast is caused by enzymes, catalysts in chemical reactions similar to the digestive enzymes in the human body. In fact, the word enzyme means "in yeast." Certain enzymes in yeast act on starch to break down the long chainlike molecules into smaller units of sugar. Then other yeast enzymes convert one kind of sugar molecule to another. Still other enzyme reactions break apart the sugar molecule (composed of carbon, hydrogen, and oxygen atoms) into ethyl alcohol and carbon dioxide. The series of reactions provides the yeast cells with the energy necessary for their growth and division (form of reproduction). In nature, yeast enzymes break down the complex carbon compounds of plant cell walls and animal tissues, feeding on the sugar produced in the process. In this way, yeast function as natural decomposers in the environment. Anaerobic: Living or growing in an atmosphere lacking oxygen. Budding: Process by which a small outgrowth on a simple organism grows into a complete new organism of the same species. Fermentation: Chemical reaction in which enzymes break down complex organic compounds into simpler ones. make their products. The experiments of French microbiologist Louis Pasteur (1822–1895) showed that fermentation could only take place in the presence of living yeast cells. He also deduced that anaerobic conditions were necessary for proper fermentation of wine and beer (in the presence of oxygen, yeast convert alcohol to acetic acid [vinegar]). Brewer's yeast is added to liquids derived from grains and fruits to brew beer and wine. The natural starches and sugars in the liquids provide food for the yeast. Deprived of oxygen during the fermentation process, yeast produce alcohol as a by-product of incomplete sugar breakdown. Yeast that occur naturally on the skins of grapes also play a vital role in fermentation, converting the sugars of grapes into alcohol for wine production. Baker's yeast, another variety of yeast, are added to a dough made from the starchy portion of ground grains (such as wheat or rye flour). The yeast break down some of the starch and sugar present in the mixture, producing carbon dioxide. The carbon dioxide bubbles through the dough, forming many air holes and causing the bread to rise. Since oxygen is present, no alcohol is produced when the bread is rising. When the bread is baked, the air holes give the bread a lighter texture. In recent times, yeast have been used to aid in the production of alternative energy sources that do not produce toxic chemicals as byproducts. Yeast are placed in huge vats of corn or other organic material. When fermentation takes place, the yeast convert the organic material into ethanol fuel. Present-day geneticists are working on developing yeast strains that will convert even larger organic biomasses (living material) into ethanol more efficiently. Thanks, this was very usefull and included information which similar articles didn't. Keep up the good work. Wow!! this is really going to help me with the school project I am doing!! Just the info i was looking for, very informative, thank you very much. AWESOME ARTICLE!!! Helped me out with a lot of research for my science project. Will help majorly in Science Project! This article is informative but fails to name the scientific names of the enzymes involved in the fermentation process and the raising of bread. Great article, however i would also like to know what the scientific names are of the enzymes used? Because i am finding it difficult to find research on the actual names of ALL the enzymes that are involved in fermentation, as well as their specific roles in the process. Any chance of help with this? I've found this article especially useful since I'm researching for a Yeast Respiration experiment at school. Would it be possible to put up a chart that displays the reaction of yeast? Hello! Thank you so much for this informational article! It was a great help. Thanks for the informational article was very useful! thanks soo much. was tons of help for my yeast project. This was so helpful! Right now for me it is 1:12am on the morning that my assignment is due and I had barely found any useful information until I came across this website. THIS SAVED ME! Thank you so much for putting all this information in such an easy to understand format! This will help me very much on my school project. Thanks for a great, informative article! Awesome article.. Should have included scientific names of various fungi...Keep it up!! I was confused with a science homework, this basically completed my homework but giving me information at the same time, i couldnt find any of this else where so thank you! I love this site so much. It helped me with my science fair project! Great, Brief- Including all the key points. Just what I needed for my practical- written report .